AlphaNet is a full-featured program that provides the tools needed to create, revise or edit messages, preview them before they are displayed, and send them to the sign, either individually or in lists of messages. The start time and day and the stop time and day for each message in a list of messages can be individually specified. A version of AlphaNet is available for any Alpha, BetaBrite, AlphaVision, Director, Big Dot, Solar, PPD, or AlphaEclipse model. The AlphaNet Message Editor incorporates text, graphics and animated GIFs in messages. Messages can incorporate data from databases using AlphaNet's ActiveX Control for real-time data display. AlphaNet's Message Emulator allows viewing of messages and modes before they are displayed. The AlphaNet Site Manager is used to set up lists of devices, sites and groups of displays. The AlphaNet Site Editor enables you to establish a variety of message communication connectivity options -- wired, wireless, or LAN. Alpha Ethernet Adapter support is included. AlphaNet can schedule messages to display at different times, locations and days. 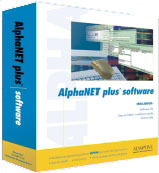 AlphaNet is compatible with multiple operating systems Including Windows 2000, ME and XP. AlphaNet includes a complimentary copy of Paint Shop Pro Version 5. Tune File Support for the Alpha Premiere 9000 Series. 38400 baud rate for AlphaEclipse models. If you are upgrading from a prior version of AlphaNet, all of your existing message files will be compatible with the new version. NOTE: AlphaNet V2 and V3 are not compatible with Windows versions prior to Windows 98. AlphaNet V2 and V3 require Windows Sockets (Winsock2) to be installed, and earlier Windows versions do not usually provide this feature. The following links may be used to display the various screens and features in AlphaNet V2.